In a missing Star Trek: The Next Generation episode, Captain Picard resolves that the only way he can save humanity is to travel back in time to the early 21st century and run for president. This comic is an accurate depiction of how it went down. Actually, Picard had 4 buttons on his collar. Yea, I’m a geek. When did Jean-Luc get demoted? But Picard is not a native born citizen of the US so would be ineligible to run or serve as President of the US. He was born in LeBarre, France. Theoretically he could run sometime later in the 21st Century if in the future there will be a Constitutional Amendment that non-native citizens can be President but not in any time up until now! The last few TNG films were something of a “Picard and Data show.” I have to agree that Picard would pick Data as his running mate, if he actually went through with this. Since the buttons were adressed: Data is in the rank of a Commander(3 Buttons) in the later going of the series, not Lieutenant Commander as indicated by the two-and-a-half buttons. 😀 Geek fest! 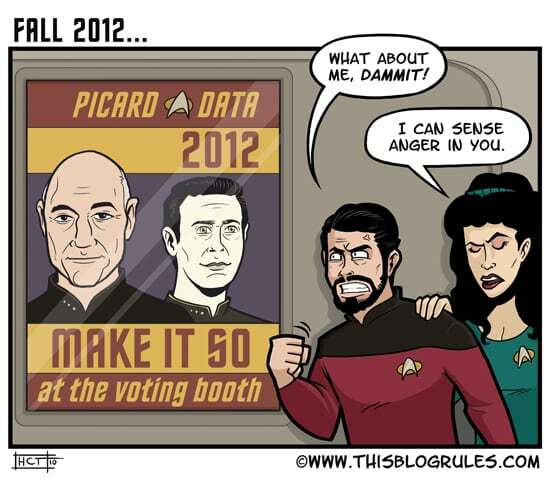 Also, if I were Picard, I´d run with Deanna for the meat bonus. In my experience with democracy, the people usually vote for the outfit that shines more purdy because the better part of the voters don´t feel like going through the real gory details of political papers. Nowhere does it say “American” President. He could run for President of France, but as usual the Yanks make it all about them.